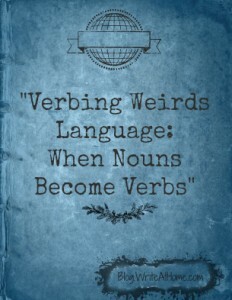 Verbification, or verbing is the common linguistic transformation of nouns into verbs. This is usually natural, fine, and practical. I find it much easier, for example, to instruct someone to Google a word than to “look it up on a search engine.” Google, as a verb, is more than just efficient; it’s also fun to to say (Go ahead and say it out loud; you know you want to). Oh, sure, I understand the complaint that a gargantuan private corporation unduly benefits when its brand name becomes part of everyday speech, but what can you say? Google changed the culture. They earned the right to become a verb. And verbification can be a legitimate way for language to evolve and grow. Access, as a verb, is a useful addition to the language. And, over time, verbification has usefully transformed all the following nouns into verbs as well: mail, strike, salt, pepper, switch, sleep, ship, train, stop, drink, cup, lure, mutter, dress, divorce, fool, and merge, to name just a few. The shift from noun to verb in most of these words happened so long ago that most of us had no idea they were once strictly nouns. My only objection comes when verbification transforms perfectly good nouns into perfectly awful and unnecessary verbs. Corporate America is the worst verbifier in this sense. Instead of providing incentives, companies have began to incentivize. Now they also talk about the dangers of disincentivizing. Yuck. When my aircraft pulls up to the gate at airports these days I am deplaned. At restaurants, my food gets plated (I wonder why my drinks aren’t also cupped or my soup bowled). People used to engage in dialogue. Now they just dialogue. Friends no longer enjoy fellowship, they simply fellowship (this one bugs me because the suffix –ship usually denotes a noun). It’s only preference, of course, but I don’t like being deplaned. I’d rather just exit, leave, or disembark. I think dialogue is no improvement over talk, chat, discuss, or converse. On the other hand, to plate seems like a good addition for people in the restaurant industry. It’s clean and obvious and I can’t think of simple existing synonym. Okay, they can keep that one. Really, I’m fine with most neologisms that creatively emerge out of everyday speech. They are usually not only convenient, but pleasing to the ear — or at least inconspicuous. Google and access work for me. I like furniture verbs like chair, table, shelve, even bed. The social media world has given us tweeting, friending and trending and given new meaning to liking. I could live without friending, but I can deal with it if it stays in its social media context. And, yes, I am aware that to verbify and to verb are themselves examples of verbification. It’s an intentional irony — get it? An old Calvin and Hobbes strip dealt with this issue and concluded with the characteristically witty line: “Verbing weirds language.” Click here to see it. You’ve got your own opinions on verbing, right? Well, go ahead and opinionize them in the reply section below! I just saw the use of “lower case” as a verb, and that was on a copywriter/ technical author forum on LinkedIn. Great article. It’s obvious that language will change, though rapid change, perhaps to appear culturally hip, could cause problems in understanding. “Access” is a good example of a useful change though it wasn’t so hard to say “gain access”. I suppose a few words will become lost as this happens and perhaps we will simply use less and less words. Then again, new words appear all the time too. It seems to me that it’s an ever eroding one. Due—in immeasurable part—to Americanisation. “Disembark” comes from the word “barque”, a type of boat. To “embark” is to “enter the boat” (the “em-” prefix is the assimilated form of “en-“). One could replace it with “enplane”, I suppose, in which case you might “disenplane”. Tacking the prefix “en-” onto a noun is just another way of verbing (or I suppose enverbing) a noun. Sure, we could continue to “disenboat” the plane, or we could just switch to “deplane”. At least it isn’t using a longer word to sound smarter, or enverbositizing — a word I just invented and will never use again. The most egregious example of verbing a noun to my ears is “to reference.” Adding an “-ize” (“referencize”) would have been even worse. What’s wrong with using the old “refer to”? What’s especially galling is that “to reference” is often used when “mention” would do. Thanks for the post…I agree and learned from it that not all “verbification” is a bad thing. My current hated word is impact. It’s Orwellian dumbing down. Impact has replaced affect and effect along with other words, and is less precise than any of them. Language for the lazy, but worse, if we don’t have the word we can’t have the concept. I agree with most of what you are saying, but isn’t “exit” also a verbification? To me, originally an “exit” is the opposite of an “entrance”, both terms nouns basically meaning “door or opening” to either get out or get in. But it has become common to use exit as a verb as in “exit at the rear”, although in this example, exit could be either noun or verb. You just prepend the word “please” to make it unambiguously a verb, if it matters. Love the Calvin and Hobbes reference. Such wisdom from the young troublemaker and his imaginary tiger. I had to think for a while on “deplane.” It’s actually quite genius. It’s mostly (always?) used passively. What other word meaning “to exit” can be used passively and not be offensive? Deplaned to the rescue. Clear, passive, unoffensive. You’re just mad that they found a way to kick you out eloquently. I’m never mad about exiting an airplane, Ryan, but eloquence is a matter of personal taste. I’m glad you like being deplaned. And I think you are right about how the word came to be. Of course, you’re not mad. Everyone would like to exit as soon as possible. There’s no need for the airline to issue an imperative. They could say: “Wait patiently and we will allow you to exit shortly.” That’s not offensive, but it implies you want to exit and will do so at the earliest opportunity. It would be an admission that they’ve made you uncomfortable and are keeping you that way, until they give you permission to fix the problem yourself by abandoning their vessel. Of course, that’s the truth. But it’s not the message they want to convey. That last sentence of my first post was meant in jest. Eloquence would make people on the Internet understand your sarcasm. Apparently I’m not eloquent. But the sentence also had a serious point. When a politician uses wordcraft to deceive, he’s being eloquent, unless you understand what he’s doing, then the negative effect of deceit is multiplied. You understand what the airline is doing, thus it bugs you. Deplaned is horrible – and unnecessary. Disembarked does the job perfectly well and has been around for much longer!